Salt Lake City prides itself in our commitment to sustainability, and recycling is the first and most basic tenet of that commitment. This commitment to sustainability and recycling is why we have gradually increased the number of services offered to residents over the last several years from curbside recycling to compost to glass recycling. It’s also, in part, why we introduced the Call 2 Haul program last year to achieve greater diversion from the landfill. Resident waste, however, only accounts for about 40% of the total amount of material being generated. That’s why we also have a construction and demolition recycling ordinance (targeting 9-10% of generated waste) and a business & multi-family recycling ordinance passed in December 2015 to target the rest. The latter went into effect in January 2018. Salt Lake City businesses generate roughly half of the waste in our city, making it important for this sector to recycle. This is the intent behind Salt Lake City’s Business & Multi-Family Recycling Ordinance (9.08.200) which took effect in 2018. The business recycling ordinance is not aimed at small properties or businesses, nor those properties which provide lower-income, Section 8 housing. Instead, it is focused on the medium- to-large properties that are creating more waste. More specifically, a business or property in Salt Lake City that generates more than four cubic yards of waste per week is required to offer recycling. This is approximately equal to eight, 96-gallon curbside containers and is roughly what multi-family properties with 15 or more units, and businesses with 10-15 or more employees, would produce. Only 10-15% of business waste was recycled before the ordinance went into effect. That number is gradually increasing, but we’d like your help! Are you aware of a business or multi-family property that is not offering recycling? Let us know! Simply fill out this form or email slcrecycles@slcgov.com and we’ll contact them to follow-up. Fall is here in Salt Lake City and leaves are beginning to drop. This is a friendly reminder to please use your brown compost bin to dispose of leaves. The brown bins go to the compost facility at the Salt Lake Valley landfill, keeping this methane-producing organic material out of the traditional landfill. 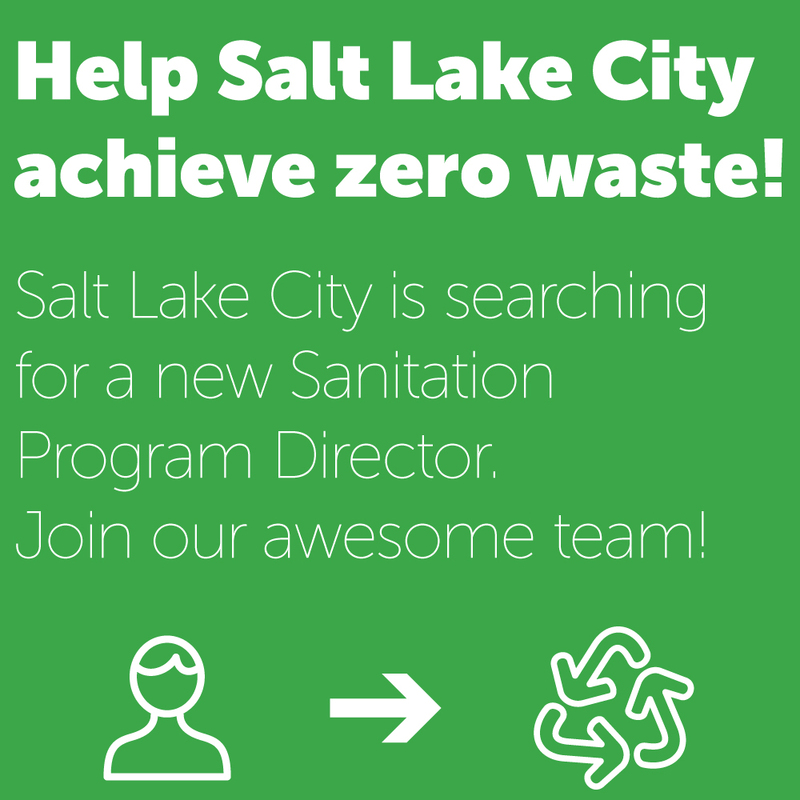 Salt Lake City is looking for a new Sanitation Program Director that will help the City achieve it’s goal of zero waste by 2040! Directs and manages the City’s operations for the Sanitation Program. As Program Director, incumbent is responsible for managing operations associated with the City’s recycling and waste collection programs, including but not limited to: curbside refuse, compost and recycling collection; neighborhood clean-up; enforcement and education; and container maintenance. Plans, develops and implements city-wide waste diversion and reduction policies and initiatives to meet the City’s goal to reach Zero Waste by 2040. Position requires specialized knowledge of best management practices for waste diversion, sanitation operations and requires the knowledge and ability to address local challenges. Plans for and directs operations associated with the delivery of citywide sanitation services, including: curbside refuse, compost and recycling collection; neighborhood cleanup; enforcement and education; and container maintenance programs. Develops and implements strategies for aggressively moving the City towards Zero Waste. Designs, implements, and monitors program including the implementation of best management practices, environmental stewardship, operating budgets, performance measures, personnel and equipment maintenance. Recommends and initiates process improvements, cost saving measures, operational efficiencies and other program changes necessary to achieve Zero Waste. Directs the preparation and necessary adjustments to the program budget, including the support needed for updates and revisions to the annual budget document. Monitors and manages budget, resources, and financial transactions. Ensures appropriate processes, procedures, and policies are in place and followed for all financial transactions. Analyzes and develops program policies, goals, and objectives to improve efficiency and effectiveness. Creates strategic plans to support the policies, goals and objectives of the program. Resolves complex issues involving operations and environmental stewardship. Ensures operations comply with City, State and Federal regulations to protect the environment and ensure safe work practices. Presents the program’s policies and positions in meetings, negotiations, and communications with the public, citizen and industry groups, Mayor and City Council members, other government agencies, the media and other public forums within assigned area of authority. Ensures employee productivity and effective use of resources by coaching, mentoring and training supervisory staff and building an effective team. Evaluates and documents performance of program managers and office staff, administers appropriate employee recognition and disciplinary actions. Develops technical specifications, project design and standards for procurement bids and proposals related to sanitation. Reviews bids and proposals and assists with the selection of contractors. Ensures contractor performance. Plays key roll establishing disaster and emergency preparedness program. Represents the department in public meetings and/or on various committees as directed. Performs other duties as assigned. Bachelor’s degree in Public Administration, Business Management or closely related degree, plus six (6) years progressively responsible experience managing public programs including a minimum four (4) years in a supervisory capacity. A combination of six (6) years of directly related program and/or management experience may be substituted for the required education. Thorough knowledge of materials, techniques, equipment, personnel management and best management practices associated with waste diversion, recycling, resource management, composting, and landfill operations. Experience in budget preparation and administration, and ability to implement budget requirements into departmental operations. Ability to establish and maintain effective working relationships with elected officials, department directors, employees, and the general public. Highly effective collaboration and communication skills. Possession of a valid driver’s license or Utah driving privilege card, including the ability to travel between office and external locations. Your Trash is Beautiful – Why Waste It? Have you spotted the new truck wraps on Salt Lake City’s Sanitation vehicles? Yes, your trash is beautiful! We’re asking Salt Lake City residents to take a second look at the things they are throwing in the trash. Did you know that 60% of your household garbage… isn’t? Let’s get real, we all know that cardboard and plastic bottles should be recycled. But what about that Styrofoam, plastic bag, plastic utensils and juice carton? Well, they ALL can go in your curbside recycling bin in Salt Lake City! Once you explore all the items that should be recycled, you’ll realize just how little should be going into your curbside garbage bin. Plastic number make you wonder? Throw it in the big blue bin! Seriously, if it is made out of plastic — recycle it. Explore all the items that can be recycled in your blue bin. Otherwise known as the yard waste bin, or the tan can, the brown bin accepts grass clippings, twigs, branches, raw fruits and vegetables, coffee grounds, eggshells and tea bags. Think of it as your friendly backyard compost bin, but picked up weekly! Explore the items that can be composted in your brown bin. Here are some handy flyers that outline what should go in each curbside bin. Any questions? Just ask us! The survey is part of an effort to improve Salt Lake City’s curbside garbage, recycling and composting services. In the coming months, residents will see a fresh, retooled #WhyWasteIt campaign roll out on Salt Lake City Sanitation trucks, social media and more. The campaign will be focus on optimizing the curbside programs and diverting as much waste as possible from the landfill. Do you have 60 seconds to spare? Then let us know what goes in your curbside bin!